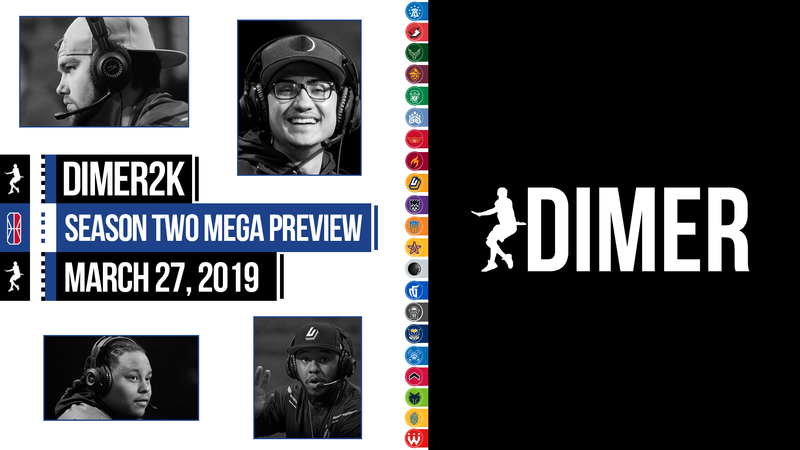 Welcome to the DIMER NBA 2K League Season Two Mega Preview! We’ve been hard at work in the lab to provide you, the reader, with the best primer possible to get yourself ready for the upcoming NBA 2K League season. You’ll find the thoughts and analysis of Will Beverina (@WillBeverina), Josiah Cohen (@josiahcohen13) and Jordan Ross (@Len_2k) on what we’re likely to see in the season two meta, narratives and storylines for every team in the league and a ton of predictions on awards, playoffs and who we think the champions are going to be. This preview is intended to both inform and predict a lot of things that are hard to predict. We won’t be perfect, of course, but we gave it our best shot (not that that will keep you from yelling at us anyway). Let’s get it. All statistics provided by 2K Analytics. Don’t expect too much similar to what we saw in season one. NBA 2K19 competitive Pro-Am is chockfull of games ending with scorelines like 53-48. That doesn’t make for a great viewing experience if you’re a professional league. The people want to see higher scoring games and superstar stat lines from their favorite players. That simply wasn’t possible on a consistent basis with the retail version of 2K19. If you mixed that with the fact that season one’s league build made it harder to shoot than ever—harder than Hall of Fame difficulty even, according to the players—games would be absolute slugfests in season two. The league obviously doesn’t want low-scoring slugfests. We saw this with the numbers guards were putting up in this year’s combine: averaging 30 points and 10 assists alone wasn’t enough to get you a spot in the draft pool. Shooting was easier than even in the retail version of 2K19. Sources tell DIMER that this has held true during preseason scrimmages. You’re going to see much higher scoring games in the league than you have in Pro-Am this year. There are still some similarities. Expect a healthy dose of pick and roll. Players have indicated on Twitter that teams have unique identities, but this may change as the league settles into a meta come the regular season. According to sources, centers won’t have the same scoring impact they had in season one, much like 2K19 Pro-Am, and have settled on the glass cleaner and sharpshooting rebounder archetypes so far. You’re also going to see every team running at least one lockdown defender, with one team even running two locks during scrimmages, a source said. Power forwards have primarily run the slashing stretch-four. No 5-Out has been reported during scrimmages, but the season is young. So what does it mean? You can expect a guard-dominant league build, with players shooting at much higher clips than in season one. That doesn’t mean other positions won’t be able to score, but the safe money is on point guards to be scoring most of the points. Some of this can quite easily change once the season hits, of course. Scrimmages can tell us a lot just based on what teams are experimenting with, but they can’t tell us everything. The meta will evolve as the season rolls along just as it did in season one. Don’t rule out a mid-season patch for the second year in a row. For now though, it’s a point guards’ world, and we’re all just living in it. Offseason transactions: Retained Newdini33 and ZDS at the cost of second- and third-round picks. Despite little fanfare or hype entering the first season of the NBA 2K League, 76ers GC stormed out of the gates to a surprising Tipoff victory and cemented itself as one of the league’s elite teams. With a 10-4 record, a tournament win and a playoff semifinals appearance last season, there’s little room to maneuver upward, especially when your lockdown defender is plucked in the expansion draft and keeping your core comes at the cost of multiple draft picks. Yet…the 76ers somehow pulled off exactly that this offseason. The gift of BreadwinnerLA, perhaps the perfect replacement for the departed FEAST, was wrapped with a bow on top for Philly at 19th overall in the entry draft. A versatile defender who you can plug into the lineup from the 3 to 5 is exactly what this team needed to complement its dangerous offensive options. And that versatility is just another weapon for a team which sported one of the most consistent lineups in the league last season. What’s especially problematic for other teams is that the new league build and meta will probably work in the 76ers’ favor more than the season one build. If the combine build and rumblings around the league are any indications, shooters are really gonna shoot in season two. That’s a blessing for the 76ers and its trio of sharpshooters in Radiant, ZDS and Newdini33. Even if Newdini—an almost 49 percent 3-point shooter in season one—is moved to a lockdown defender, it’s not too unlikely to think that archetype could still hit corner 3-pointers. And any avid season one watcher of the league doesn’t have to be reminded how good ZDS and Radiant were from beyond the arc—perhaps the best shooting backcourt of them all: Radiant averaged 45 percent from three on almost five attempts per game and ZDS averaged 52 percent from deep on over four attempts per game. Another overlooked aspect to this may be the importance of a secondary ball handler, which could very well translate from the Pro-Am meta to the league meta. If that’s true, it’s vital to remember that while ZDS is one of the league’s great sharpshooters, he also qualified and was drafted as a point guard in season one. For good reason, too: ZDS ranked second in assists per game and first in steals per game while having the lowest usage rate during the combine out of all point guards in last year’s draft class. That’s a hell of a wrinkle to incorporate into your offense if you’re Jeff “TheWhiteKite” Terrell, and one you can expect to see if teams sic their lockdown defenders on opposing point guards. So it’s going to be a good season for the 76ers. Expect them to be heavily in the conversation for a championship again in season two—something catastrophic would have to happen for this not to be the case. The challenge now comes in that while the 76ers may have gotten better, so did a lot of other teams. The season two draft class looks like it will be a good one, and it’s hard to agree on any one team being the favorite. But Philly is well-equipped to handle even the toughest challengers on their path towards a league title. This team will win a championship if… Radiant plays at or above the level he did in season one. While the 76ers prided itself on its team-oriented system which incorporated every player as a key cog in the machine, Radiant was undoubtedly the engine running it all. The first-round selection was the master of the drive-and-kick and finished top-10 in the league in both points and assists. Without Radiant, the 76ers system would not have worked, a point proven by his poor play in the playoff semifinals leading to a playoff exit. If he at least returns to form in season two, the 76ers will be serious threats to win it all just as it was in season one. That’s the mentality with which Blazer5 Gaming enters the 2019 season, just several months removed from what it thought should have been a championship-winning campaign. The Blazers were consistently the best team in the league last season, and without an animatronic backboard and burning hot Knicks Gaming squad, might have been champions. This year, the goal is to make “might have” into something real. The Blazers return MVP and DPOY winner OneWildWalnut, MVP candidate MamaImDatMan, and glue guy Lavish_Phenom from its 2018 squad. It made a contender-type move in trading its first-round pick for wing scorer King_Peroxide. He will help replace the departed DatBoyShotz, selected by Hawks Talon GC with the first pick of the expansion draft, and the tertiary scoring that he capably provided throughout the year. The Blazers also added Too Cool and brought back Jomar12 PR in the draft. But this season’s spotlight will once again fall on Mama and Walnut, who took up two of the five slots for MVP candidacy. Mama is the team captain. Walnut is the superstar. Both are vocal leaders on the league stage. If their pick-and-roll chemistry returns to its previous heights, the Blazers will once again be easily able to walk the walk while talking the talk. The complementary scoring role looks likely to have been filled seamlessly by King_Peroxide at shooting guard; his fit is a little more natural there, allowing others to play lock, than trying to recreate the 1-4-5 “Big 3” that served Blazer5 so well last year. Walnut probably won’t be as dominant this season. Through no fault of his own, centers won’t be as dominant as they were early in the 2018 season, when paint mashing was the effective, de rigueur strategy. To his credit, however, Walnut proved just as good in the post-patch league. But 2K18 has lessened the game-changing impact of the center. Walnut should still excel, but repeating as MVP and/or DPOY is incredibly unlikely. Fortunately for the Blazers, they have an MVP candidate waiting at 2K19’s most important position, point guard. I think we forget how good Mama can be. His stats won’t blow anyone away, but his intangibles and ability to dictate the flow of the game make him a lethal leader for the Blazers. Has the rest of the league caught up to them? That’s the question to watch. We can expect more of the same from the league leaders last season, but we know to expect more from the field. Will the Mama/Walnut pick-and-roll rank among the league’s best combos again? Will Lavish prove to be an above-average or even average lock? Will the lack of a true head coach catch up to them this season? Those are all serious questions that the Blazers need to answer. It’s not enough to point to a backboard as being the culprit of a team’s disappointment. This team expects to win a championship, and true champions will be able to overcome even the most painful of layup animations. This team will win a championship if… They’re the best team in the league for the second year in a row. The Knicks got what they deserved, but the Blazers were the most consistent team throughout the season. They’ll need to reprise that form in season two. It won’t be the same this season, and the team will need to adjust alongside the entire league, but few squads have the proven star experience and winning pedigree that the Blazers possess. It may well take MVP-level performances from Mama and Walnut again, but if they’ve done it once already… Championship or bust. Who’s ready to fear the deer? The Bucks are working on it. They believe in the roster that they’ve constructed, which features three first-round picks (ARooks, Plondo and SlayIsland), one second-round pick (Chaddynick) and two final-round selections (BigMeek, 2018 sixth-round pick, and RSG, fourth-rounder this year). They think their guys can score, and, in a year where backcourt scoring is particularly important, that matters a great deal. ARooks (then Game6Drake) scored the first-ever basket in the NBA 2K League, and if he and new addition Chaddynick can dominate in the backcourt, then the Bucks will be proved right. ARooks is an interesting figure. When on, he’s a fearsome scorer from any spot on the floor. But he hasn’t shown himself to be an equally skilled defender or facilitator, which is why the Bucks felt the need to add a point guard early in the draft. This season will be crucial for his future in Milwaukee. Another down year may well see a mutual disaffection between ARooks and the Bucks. If the team plays up to and exceeds its talent, that shouldn’t be an issue. More than anything else, the Bucks believe that they have unparalleled chemistry. Plondo and SlayIsland join the team from Pro-Am team Island Gang. ARooks and Meek found some good pick-and-pop synthesis at the end of last season. A crucial element to the Bucks’ performance will be the help and coaching of draft analyst Sam Pham, the key figure in constructing this roster. He sought players he believes can help the Bucks attain their goals, and heightened communication and constructive feedback in both directions will help the Bucks immensely. What will the Bucks’ defensive scheme be? With Plondo almost certainly locked into the frontcourt initially, the important role of lockdown defender may be thrust into the hands of local Milwaukee man SlayIsland. They say lock is easy to play, but the Bucks don’t have much time for any player to ease into it. Defense is a team-first phase, though, so if the chemistry that the Bucks believe they have materializes, that should translate to enough rotations and help defense to cover up a below-average lock. Some consider it a win to go out and get every player you want in the draft, no matter what. That’s what the Bucks did. They haven’t won just yet, but they’ve got an incredible opportunity to prove a lot of people wrong and prove that they did indeed walk away from the draft with a win. Sam Pham isn’t expected to coach for the Bucks, which is a disappointment. The competitiveness of every team makes every small advantage worth pursuing. Not having a tactically proficient and 2K-savvy coach on the mic game in and game out passes up on one of those small advantages, and won’t exactly help the Bucks throughout the year. This team will win a championship if… Everything comes together, and I mean everything. Perhaps an unexpected player will turn out to be a dominant lock. Perhaps the backcourt of Chaddynick and ARooks will strike the perfect balance and provide sufficient firepower. Perhaps Plondo will exceed expectations and dominate in the way sixth-overall picks are expected to. The last sixth-overall pick, OneWildWalnut, won MVP and DPOY. If Plondo recreates that scenario, then the Bucks will be in a good position to bring home a title and prove every doubter wrong. Cavs Legion had quite the season. The team captured fans’ imaginations at the Tipoff, as Hood averaged over 40 points per game in the group round. But the Cavs endured a rocky road during the year, ebbing and flowing throughout the regular season. It earned a playoff berth with a convincing close to the season as Hood moved to point guard, and defeated burgeoning nemesis Raptors Uprising in the first round after falling to the Uprising several weeks prior. But eventual champion Knicks Gaming bounced it from the playoffs after the Cavs took a 1-0 series lead, and questions lingered as to its comportment heading into season two. One offseason later, things look dramatically different. Trying to smoothen its ride, the Cavs traded Hood to T-Wolves Gaming during the expansion draft for the right to select former Bucks Gaming player oLARRY, whom they’re betting is fully returned to form after sustaining serious injuries in the horrific tragedy at a Madden event in Jacksonville, Florida last August. The team brought back Sick x 973 and Godddof2k, two season-one stalwarts, and drafted three calm, low-maintenance guards in the entry draft. The team also brought on a new coach, Austin Peterson, who primarily serves as a video coordinator for the Cleveland Cavaliers’ G-League affiliate, the Canton Charge. With the hire of Peterson, the Cavs are most likely hoping to follow the template established by Warriors Gaming Squad, which boasts G-League Special Assistant to the Head Coach Tommy Abdenour as its headset helmsman. Sets and plays seem more in vogue this season, and the Cavs are attempting to ride that wave at the front. Defense shouldn’t be a problem. Sick, Godddof2k, and oLARRY all have strong defensive pedigrees, at any position they may eventually play. The presumptive starting lineup has Godddof2K at lock, oLARRY at power forward, and Sick at center, a frontcourt that should shut teams down fairly effectively. But the archetypes they choose will be crucial (perhaps a sharpshooting rebounder for oLARRY?) since the defense-first squad needs all the frontcourt scoring help it can get. Can the Cavs score? That’s the question they need to settle. Strainer was a steal in the third round, a player whose advanced metrics marked him one of the best guards in the draft pool, but one scorer does not an offense make. They’re betting on LYKaPRO, who played point guard for the Warriors last season and who shot up draft boards late in the offseason. One suspects that the veteran point guard will mesh well with the basketball-sourced head coach. But LYKaPRO scored under 13 points per game last season for a Warriors team that admittedly underperformed, with his EFG% barely clearing 60 percent. His combine numbers were incredible, and that’s what the Cavs need in the regular season. Savage returns as the Cavs’ sixth player; he performed admirably in fill-in roles last season, and his return is a great fit on and off the court for Cleveland. This team will win a championship if… They attain an unparalleled level of focus. The Cavs roster is one of the most experienced and veteran rosters in the entire league, meaning that they should be able to avoid distraction and lock in as much as possible. Competition figures to be so tight this season that a lack of focus for any team will be extremely detrimental; the Cavs have set themselves up in the best possible position to avoid losing focus. If they maintain that all year long and take it up a notch when the going gets tough, they could be the savviest and strongest team to take down. Offseason transactions: Retained Profusion at the cost of a third-round pick. Celtics Crossover Gaming’s 2018 season was a story of near misses. It nearly won the Turn tournament, only for an unstoppable Blazer5 squad to prove unconquerable. It nearly locked up the first-ever playoff spot in the Ticket tournament, but eventual champion Knicks Gaming got extremely hot at the right time. It nearly qualified for the playoffs in the customary way, on the last day of the season, but fell short in a disappointing loss to Magic Gaming. Nearly, nearly, nearly. In the draft, however, the Celtics got exactly what it wanted. It snatched Bully away from numerous competitors in the first round, saw NO xAUTOGRAPHSx—whom it considered taking in the first round for some time—fall to it in the second round and snagged Suavy with its final pick. All have experience playing with oFAB previously, especially in Team Up. That’s the new trend in the NBA 2K League, and the Celtics are not just nearly there: it’s at the forefront. This season, the Celtics are looking for its hard work to pay off. There may not be a better coach-star relationship than the connection between Ricco and Fab. The former second-overall pick has worked on himself and his game over the offseason, and there’s nothing more the Celtics could hope for from its franchise centerpiece. Fab will be considered among the early favorites for MVP, and for good reason: the league build this season will be guard-dominated, and Fab is one of the best guards in the world. The rest of the team should fall quickly into place. Ricco devises some of the best sets in the league, and with Bully and Profusion (already well-versed in Ricco’s playbook) he’ll have something lethal to throw at teams. Managing to get NO xAUTOGRAPHSx in the second round, almost certainly to be paired with Fab in the pick-and-roll, was pure poetry for the Celtics. In Mel East, it has one of the best trash talkers in the league. Perhaps the biggest question is, what held back the Celtics? A lack of sustained consistency seems to be primarily culpable. A look at the numbers indicates that a huge—perhaps oversized—burden fell on Fab’s shoulders. The two-sharp meta probably wasn’t the long-term answer. But Fab had a surprisingly low EFG%, 58 percent, and surprisingly high turnover rate, at 18.3 percent. Is this Boston team good enough to exceed its “nearly” phase? Coalescing in the league is more challenging than playing together in Team Up. It’s also the sort of thing that having a well-respected player’s coach is fit for. With Fab running point, this should be a playoff team at least, but winning a championship is no easy task in the NBA 2K League. Plenty of time to pahk your cahr in Hahvard Yard, as they (don’t) say, and hop on the Celtics bandwagon. This team will win a championship if… Fab is the MVP when it matters. That doesn’t mean regular-season MVP. Being far and away the best player on the court come crunch time is what will allow the Celtics to actualize the talent it possesses. Having merely an above-average point guard won’t win any rings. Fab needs to be the best player in the league when it counts. Nothing less will get the Celtics past the “nearly” phase and into NBA 2K League history. Grizz Gaming made due with what it had in season one. Helmed by Lang Whitaker, an NBA media and industry veteran but a lesser-versed NBA 2K figure, the team misfired on its first-ever draft selection but made up for it in a big way when it scooped up AuthenticAfrican, one of the most unlikely superstars to emerge last year. But one star isn’t enough in the NBA 2K League. The Grizz surrounded its Canadian cornerstone with modest yet unremarkable talent, and from the very beginning was never really in the playoff race. Hell, not even an 84-point game from AuthenticAfrican could guarantee a Grizz win. But Whitaker now has a year of competitive NBA 2K knowledge and experience under his belt and was able to refresh the roster going into the offseason with a bonafide superstar and the seventh overall pick. The experience seems to not have been for nothing, as the Grizz went point guard—again—in the first round, but opted for a legitimate scoring threat in Vandi over the traditional, pass-first style of Winner_Stayz_On. The former works a lot better than the latter in NBA 2K, and should especially work well in season two. It (in all likelihood) ensures that Memphis will no longer be a one-man ar—er, show. There’s little reason to doubt Vandi’s game won’t translate to the league, and the Grizz seem to have found upgrades in its complementary pieces as well. Jayrod is a pure sharpshooter with success in the Pro-Am realm, and Toxsik revitalized himself in the offseason after a pretty dismal season one. The returning UniversalPhenom, all but forced to step up as the team’s second option last year, will likely find himself in a more suitable role with Vandi ready to take over. DDouble2K was one of the better sixth men in the league last season both on and off the court. But the question is always is it enough? For a championship? Doubtful. For a playoff berth? Maybe. For that to happen, Vandi and AuthenticAfrican will have to live up to their potential and Jayrod will have to establish himself as one of the top sharpshooters in the league, a tough task in today’s NBA 2K. The team will also have to get more creative in season two. The Grizz Gaming season one offense looked absolutely terrible at times, and the greatest tactic seemed to be “feed it to AuthenticAfrican,” which, to be fair, isn’t the worst strategy, whether he’s on a shot-creating slasher or at center. But it’s going to take more than that. There are a lot of tough defenses in the NBA 2K League which will feast on stale, uncreative offenses. Teams will gameplan. It’s unlikely another super-archetype like the shot-creating slasher will bail anyone out, either. Whitaker will have to learn how to maximize the new talent he has at his fingertips. Fortunately for him, he’s put himself in a better position to make some noise in season two. This will likely be a solid team, and it’d be a surprise to find them at the bottom of any power ranking, where they featured so prominently in season one. This team will win a championship if… The Vandi-AuthenticAfrican pick and roll is souped, first and foremost. It has potential to be one of the most deadly two-man games in the entire league, and the Grizz will have to make it its bread and butter this season. AuthenticAfrican will have to adjust not having to be the guy who does it all anymore, but hey, what about his first season makes you think he can’t adjust to anything? As mentioned, the Grizz supporting cast looks better compared to last year, and if they hold up their end of the deal while Vandi and AuthenticAfrican do their thing, it may still be hard to win a championship, but don’t be surprised at a playoff run. Hawks Talon, one of the four new 2019 expansion teams, doesn’t expect to fly under the radar for much longer. The Hawks boast two highly touted first-round picks (different drafts) in DatBoyShotz and DevGoss. Shotz, whom the Hawks selected with the first overall pick in the 2018 expansion draft to no one’s surprise, served as one of the best third options in the league last season for a dominant Blazer5 Gaming team that finished shy of its championship hopes. Dev coached Magic Gaming for part of the 2018 season, but is more known for his Pro-Am exploits and memorable Road to the All-Star Game tournament appearance in the NBA 2K17 cycle. To complement Shotz and Dev, the Hawks have assembled a mixture of experience and youth. Arsonal x (expansion draft) and XxSTL2LAxX (entry draft) both played in the league last season, Arsonal for CLTX Gaming and XxSTL2LAxX for Bucks Gaming. The team added guards Rando and Jay A Fool in the middle rounds of the entry draft. There’s no tried-and-true gameplan that the Hawks seem to be following, and that’s in large part due to the absence of such a gameplan in general. The team seems likelier to catch fire for one tournament than sustain an elite level of play throughout the season. Luckily for them, that’s what won Knicks Gaming the championship last year. What is this team’s biggest strength? There’s a lot of depth in the backcourt, with Dev, Rando and Jay A Fool all capable combo guards. The wing versatility is there too, with XxSTL2LAxX and Shotz seemingly able to alternate forward spots depending on the day. We’ll see how Arsonal fares with a pick-and-roll partner not quite at the level of Celtics Gaming maestro oFab—he’ll either become more of a safety valve in the middle, or may be forced to becoming a primarily rebounding-style center. It remains to be seen how effectively the Hawks will fit into the presumptive meta early in the season. Dev starred in the SXSW Draft Clash, but that’s no guarantee of stardom in the league. The Hawks will rely on him and his backcourt partner to create the bulk of their scoring, most likely in the pick-and-roll with Arsonal. Coach Wes Acuff’s placement of DatBoyShotz will be crucial to determining the team’s potential for success this season. Will Shotz play lock, and likely compromise a large quantity of the offense that made him the first pick in the expansion draft, or will he slot in at a more naturally offensive position even though the Hawks don’t have a tried-and-true lock? If it’s the latter, another big decision looms: does Shotz slide down to shooting guard to maximize his offense, even though that will force one of the backcourt players out of his comfort zone, or does he try to recapture season one’s magic at power forward? The Hawks have given themselves a good amount of potential magic. Figuring out how to access it won’t be so easy. This team will win a championship if… Dev becomes one of the best guards in the league. He looked the part at SXSW, but that means nothing come the season. He has plenty of experience on the big stage and the name to match. But the attributes that landed him the Magic Gaming head coach role last year are far more important. How he internalizes those lessons on the court, and the player he turns into as a result, has the potential to make or break the Hawks’ season. Heat Check Gaming, the first runner-up in NBA 2K League history, is looking to become the second-ever NBA 2K League champions. That’s no small task, of course, but the Heat knows what it takes to coalesce as a unit and adapt to whatever the league throws at them. Spurred by the mid-season patch, the Heat closed the 2018 regular season on a hot streak and rampaged into the Finals, only to be cooled off by even hotter Knicks Gaming. The molten core of Hotshot, Majes7ic, and 24K Dropoff is back for season two after all four expansion teams let Dropoff pass them by in the expansion draft. Hotshot, the best shot-creating slasher last year, will make his impact felt in a different way this year, but don’t expect a sharp drop-off in performance from the season one MVP candidate. Majes7ic, ever versatile, could theoretically start at all five positions for the Heat this year. The three are very familiar with Heat Check coach Derric “FamousEnough” Franklin, and they’ve all got experience aplenty under their belts. More importantly, they’ve been close to the mountaintop. They almost tasted a championship last season, and they want it more than ever this year. At the draft, things seemed to go Heat Check’s way, as usual. They picked Lotty in the first round, which will contribute to the professional and experienced core in Miami. The third round, though, was where they struck gold, swiping JMoneyRep817—an easy first-round pick based on talent—with the 52nd overall pick. In ChaChingSingh they found a clutch player and a student of the game. How good is Heat Check? They didn’t blow anyone away in the 2018 regular season, and they failed to win a single in-season tournament game. They embraced the shot-creating slasher more than all but one or two teams, and while they know it won’t be there for them this year, its absence certainly deprives the Heat of a tried-and-true gameplan. Few are better at adjusting than Famous & co. But their path back to the playoffs is not as simple as that of most finalists. Heat Check needs JMoney to be the best player he can be. A steal of that magnitude in the third round is only worth it if the player lives up to his talent. Point guard is far too important this year for any championship hopeful to lack an above-average point guard. While constant contributions from the season one team members are a safe bet, Heat Check needs to ensure that JMoney’s fall was a monumental failure by the 20 other teams, and not a sign of things to come. As long as he stays committed and focused, the Heat should be fine. This team will win a championship if… It out-savvys everyone. Lost in the glitz and glam of Miami is the fact that Heat Check relies on its smarts more than most teams. That’s not to say that its bereft of talent, but it is to say that few teams are as capable of seizing a successful strategy and sticking with it, and thereby maximizing each player’s potential and role in the roster. If it finds the lineup that works for them and out-adjust and out-think the competition, the star talent of Hotshot and JMoney will put it over the top. Jazz Gaming wants to bounce back from last season’s collapse. To do that, it plans to control what it can control. New coach Jelani “Comp” Mitchell leads the Jazz into the 2019 season after the 2018 iteration raced out to a 5-2 start before dropping its final seven games. This year, it’s supposed to be different. No other team boasts two top-3 draft picks. The Jazz have Yeah I Compete and Ria at point guard and center, respectively, and if that pairing lives up to its draft billing Salt Lake City will have reason aplenty to throw a party. The Jazz also protected Deedz, last season’s third-round pick, and added a bevy of sharpshooters in the draft in EasyMoney, Gliz and KevDontMiss. Compete needs to turn into a superstar this season. Last year’s third overall pick is one of the more polished and experienced players in the league, but he didn’t display his full talent in season one. Compete averaged a double-double, but shot just 41 percent from beyond the arc and finished with an EFG% of 58.70 percent. His offense is too important to the Jazz to reprise those numbers. Running pick-and-roll with this year’s No. 1 pick should bump up those stats. But the win-loss column, not stats, will determine Compete’s legacy, and it’s to improve that ratio that he must take his offense up a notch. Jazz Gaming has a bevy of shooters this year. It earned its 5-2 start in 2018 when its shooters were firing on all cylinders (Smoove even led the league in FG% and 3PT% for a few weeks), and it’ll look to replicate those high marks with the quality shooters it selected in the draft. The offensive nature of its role players, however, places an inordinate amount of pressure on its lock—presumably Deedz, but don’t be shocked to see Ria get a start or two at lock this season. Whoever plays the 3 will have to carry his team defensively. Perhaps the most interesting aspect of the Jazz’s season will be its coexistence off the court as veterans and rookies. Compete and Deedz reportedly wanted more veteran presences for season two. While I’m sure they’re perfectly happy with the team’s selections, immaturity seemed to play a factor in the Jazz’s collapse last season, and no one in Salt Lake City wants history to repeat itself. The Jazz will be a microcosm of the first-ever NBA 2K League veteran-rookie adjustment period, and, with an experienced former third overall pick and a young first overall rookie charged with leading the team to the playoffs, the spotlight will be on the Jazz more than most. This team will win a championship if… Compete and Ria really do turn out to be the best pick-and-roll duo in the league, or at least the best guard-forward combo since Stockton and Malone. Their draft slots certainly indicate the potential, but neither player has shown himself capable of taking that into each and every game at an elite level. Mitchell may turn out to be a genius coach, and he may not, but even the best coaches are only as good as what their players do on the court. The talent is certainly there. If it is harnessed and deployed effectively, it has the explosiveness to win the Jazz its first championship. When you look up the definition of “disappointment” in the dictionary, you might come across a picture of the Kings Guard logo. This was a team who many considered to be a favorite to win it all after draft day. The initial selection of Mootyy was questioned by some, but with the following rounds—where the team was able to select WorthingColt in the second and come back in the third to select Timelycook—the Kings shot up preseason power rankings and ended with one of the more highly-touted “Big 3s” in the league. Watching it at first glance, it seemed like a team filled with confidence. It was one of the more vocal teams in the league, and regardless of how ugly the season was as a whole, it had some pretty amazing upsets (most notably against the best-record Blazer5 Gaming in the Ticket tournament). However, as the ever-growing popularity of this saying goes within the league, “the games still have to be played,” and believe it or not, they were. The Kings would be the first ones to admit that it was one of the teams to fall victim to this saying. There were still so many things you could have pointed to that went wrong on the surface. Perhaps most glaring was the team’s lack of a head coach, a potential detriment for a team with high-energy players who could have used more structure. Beyond that, Kings Guard lacked a true primary ball handler. This isn’t a knock on Timelycook, who is a phenomenal talent. However, he’s regarded as one of the better defenders in the community, and having him facilitate the offense is not maximizing his best abilities. With such a disappointing season, tough decisions had to be made by the organization. That started with the release of first-round pick Mootyy, the highest-drafted player in season one’s class who wasn’t retained. But a refresh of the roster still left the Kings with the same two problems: a lack of a coach and a lack of a point guard. The Kings took care of the former with the hiring of DJ Layton, a college point guard and competitive Pro-Am player—a background which has brought good results so far in the league. Next was the point guard, an easier proposition with the Kings sitting at third overall in the draft. With Ria and Gradient projected to go one and two, and the draft indeed going that way, the Kings had their pick of the bunch. BP was widely considered one of, if not the most talented point guard from this year’s pool, and what better way to ensure the fixing of your point guard issues other than selecting who many considered the best. The backcourt only got more talented with the subsequent selection of BallLikeSeem, a season one veteran who fell victim to the house clearing of the Mavs GG offseason. With this selection, you could make a case that Kings Guard now have one of the most electrifying backcourt duos in the entire league, a good spot to be in with how the meta looks to shake out. What remains to be seen is if the Kings found a replacement (or at least supplanted a season’s worth of production) for TimelyCook. The Kings to its credit used its next three picks in the draft on players that specialized in defense. Roman (3rd round), Yusuf_Scarbs (3rd round supplemental pick) and Zakky610 (4th round) are all lockdowns who many consider to be some of the best from the PlayStation 4 side of Pro-Am who will be tasked with battling for the small forward and power forward starting spots. But the issue of replacing Timelycook was only compounded with the report of BP requesting a trade off the team. There are so many things you can speculate as to why this happened. BP could be homesick and doesn’t want to live on the other side of the country. There could be hostility between teammates. He may not be mature enough to handle the pressure of turning this organization around with the talent it brought in. Only Kings Guard knows the exact reasons for this abrupt decision. But all this does is throw another wrench in its already tainted offseason. When you look at this team on paper, it has all the talent in the world. But we’ve come to find out in this league—with Kings Guard specifically—it takes a lot more than names on paper to be successful. Questions arose before the draft when the Timelycook’s suspension was announced. And now the questions are only getting louder as we get closer to the season. If the Kings can figure out the personalities of these players and find chemistry, there’s still a possibility to right this ship. Quite a few things, however, point to this being a complete disaster for a second straight season. This team will win a championship if… It finds a way to get guys to buy into its culture. Kings Guard has done a great job of drafting the names. But there’s been a major disconnect when it comes to chemistry and production on the court. Understanding that, the last thing you want surrounding your organization coming into the season is a trade demand by a player who has yet to play a game. Add to that the loss of arguably your best player from season one, and you are officially in a position nobody wants to be in. The Kings should start small by fixing this enough to compete for a playoff berth. At this point, a championship seems so far gone. Offseason transactions: Retained IdrisDaGoat6 and YeyNotGaming at the cost of second- and third-round picks. Cinderella is quite honestly the only way to describe Knicks Gaming’s season in 2018. The hometown heroes—a middling team pre-patch team which at times seemed on the verge of a breakthrough and other times looked downright mediocre—flipped a switch midseason and made the two greatest elimination situation runs in the league’s young history, winning the Ticket tournament before taking down the league’s best teams in the playoffs to secure the first-ever NBA 2K League championship. But no good season goes unpunished, and the success came at the cost of NateKahl, a beloved figure and Finals MVP who was plucked in the expansion draft by new cross-town rival Nets GC. That’s not to say the Knicks’ offseason was awful. The team was able to keep its core and picked up the sharpshooter Malik with its first-round pick this month, giving them just that much more firepower to work with in season two. But is it enough? If you’re a cynic, it’s easy to point out that the Knicks went 5-9 for a reason. As previously mentioned, this was an average team pre-patch which couldn’t figure out what lineup it wanted to run, couldn’t shoot worth much and even had locker room issues. It wouldn’t be that hard to argue that the team just got hot at the right time and rode that to a title. But the optimist in you could easily say that the efforts made to overcome those early issues show immense growth. The team made the adjustment that saved its season by settling on GOOFY757 as the center and giving iamadamthe1st the green light to shoot, shoot, shoot. So which Knicks team are we going to get in season two? There’s a strong argument to be made that the meta will strongly suit the Knicks as they’re currently constructed. That shooting from Adam that helped carry the Knicks to last season’s title? It should be even deadlier this year. And while YeyNotGaming was a serviceable backcourt complement, the Knicks got perhaps one of the best sharpshooters in the draft with the pickup of Malik. At any rate, the Knicks will be an interesting case study for season two. The team isn’t lacking in talent, but there are a number of teams who likely outpace them in that department. So how far can team chemistry, and the confidence that comes with being a champion, go? That’s one of the new questions we may get to see answered as we enter the second season of the league. This may be one of the hardest teams to predict. If the Knicks can keep that switch set to “on,” then they’ll be back in the mix and a serious threat to repeat. If they fall into the same traps again that forced them to have to make a miracle run in the Ticket just to make the playoffs, they’ll find themselves on the outside looking in at the end of the season. For now, they’re the kings of New York, and the NBA 2K League, and that’s more than any other team in the world can say. This team will win a championship if… It finds its chemistry early this time around. Last season’s version of the Knicks got off to an average start because it wasn’t quite sure what its identity was. A quicker start and a more confident assertion of what kind of team it should be will mean good, early results for the defending champs. The run through the Ticket was an iconic moment and something the league won’t soon forget, but it’s better for the blood pressure if you don’t have to depend on that to make the playoffs. Fortunately, the Knicks already have most of the formula down with so many returning faces. It’ll likely be smoother sailing out the gate, and possibly down the stretch in the team’s bid to repeat. It’s rare for a Lakers franchise to be so low-profile entering the season, but that’s where Lakers Gaming sits at the moment. There are no larger-than-life superstars, few eyes trained on everything they do and the team holds no grand lore in the halls of history in the NBA 2K League. A stark contrast to its NBA counterpart. What Lakers Gaming does have is a collection of castoffs, for lack of a better word. Just four first-round selections from the season one draft went unretained in the offseason, and two of them—Mootyy and Kontrul—now find themselves on this roster. There’s also a season one second-round selection, Detoxys, who couldn’t find his place on Raptors Uprising GC and watched his team rattle off a 7-1 run from the sidelines. Vert, the leading scorer and one of the few bright spots of the dismal Warriors Gaming Squad season, was put on the trade block by his former team before finding a home in L.A. Mix in former Kings Guard sharpshooter Safiya4ya, and the Lakers are one of just five teams to feature at least five season-one players. Hardly a flashy roster as we enter a season where most teams are admiring the shiny new rookies they picked up in the entry draft. But that may be exactly how this team wants it. As the Los Angeles Lakers of the NBA struggle amid the arrival of its own larger-than-life star, the term “low-ego” has been used by Lakers Gaming to describe its own roster. The level-headedness of multiple Pro-Am and NBA 2K League veterans could be the team’s strongest asset in season two. That isn’t to say Lakers Gaming doesn’t have talent. Mootyy showed he can hold his own—and even dominate—in the paint when given the room in the back half of season one, and there’s the aforementioned success of Vert’s individual production last year. The team is also high on second-round entry draft pick Kev, who supposedly had other suitors, and who looks to slot in as a pure sharpshooter come game time. Questions remain about Kontrul and Detoxys. The NBA 2K League, and the season two meta, demand an aggressive point guard who can provide a consistent scoring punch. Kontrul tried to be that player for Magic Gaming last year and was inconsistent in such a role. The Lakers’ success will depend heavily on whether he’s more comfortable as a high-scoring guard in season two. And though the season one league build didn’t hold much room for stretch-fours, Detoxys still has to prove he can make an impact at the position just two years removed from his Road to the All-Star Game success. It may also be likely that Vert, one of the better scoring big men in season one, will be moved to a lockdown defender. It’s worth wondering if that transition will translate to the league, especially at the cost of the 10th overall pick in the draft—which the Lakers gave up to acquire Vert—where there were still plenty of difference-makers available. The jury may still be out on whether that was the right move for the team. Still, rumblings from multiple sources suggest the Lakers have played better than expected in preseason scrimmages and have found on-court chemistry. It’s up to you how much stock you put into such a thing, and there’s certainly no reason to crown the Lakers as champions based on exhibition matches. But it could reveal that all the season one miscues, the offseason uncertainty, and the strange sense of chemistry that comes from such things, may be the reason the team performs a little better than an initial look at the roster suggests. This team will win a championship if… The talent matches the supposed chemistry. Things seem to be falling in place for the Lakers, but every team is optimistic about its chances in the preseason. Good scrimmage results are fine, but the games still have to be played. It’s a longshot at this point that the team makes noise as a contender, but the Lakers have enough going for them that it’s not entirely outside the realm of possibility. Many were left confused after Magic Gaming selected its 2018 roster, a motley crew of lesser-known players. Most expected them to dwell around the bottom-third of the league throughout the year. However, the Magic were only eliminated from playoff contention by virtue of the Knicks taking the final spot with its Ticket success, and look to add to that momentum headed into season two. The low expectations throughout the community seemed to be due to the lack of “big name” players the Magic selected. Outside of Kontrul, the Magic were filled with players who had a lot to prove. Protected players UCManny and KingCamRoyalty were huge bright spots throughout the season. UCManny showed his versatility all season long and was considered a player the organization must retain headed into season two. KingCamRoyalty started out as the team’s sixth man and capitalized on the opportunity as soon as his name was called. In the offseason, the Magic hired former Mavs Gaming head coach Jonah Edwards. The hiring was interesting as the 2018 Mavs severely underachieved while Jonah was at the helm of it all. However, many factors can play into why certain scenarios don’t work out, and Jonah having a second chance with Magic Gaming is one of the better coaching storylines headed into season two. He’s an extremely knowledgeable NBA 2K mind—what some could argue the Magic were lacking last year, prior to the arrival of DevGoss—and already having the experience of what didn’t work in season one benefits Magic Gaming. The Magic headed into the season two entry draft with some pertinent questions. With its decision to not retain 2018 first round pick Kontrul, the Magic left a major void at his respective position. Many speculated the Magic would fill that void with their first pick of the 2019 entry draft. However, the Magic ended up selecting Reid, known more as a shooting guard. The point guard position looks to be his, though, with the selection of KelMav later in the draft, meaning Reid will have to prove he’s more than just a shooter. The Magic then selected Reid’s Pro-Am teammate, DT, with their second-round pick, providing a bit of instant chemistry to the locker room. If the Magic are expecting the transition to point guard to take some time for Reid, selecting a player he has familiarity with isn’t the worst move at all. What will work for the Magic again, as it did in season one, is the team’s versatility. Orlando was able to move players around almost at will last year while still keeping a well-balanced offense that didn’t need a superstar to succeed. With the same interchangeable pieces this year, you may see more lineup switches than you would see with your average NBA 2K League team. After going down the path less traveled in the season one draft, the Magic definitely selected a few more community-friendly names heading into season two. Look for the Magic to be a team that fluctuates between trends of playing like a playoff team and looking confused, as it was last season. The risk of taking Reid to play point guard is a risk that could really make or break the Magic’s 2019 season. Add to that the questions that surrounding the production of players like KingCamRoyalty and KelMav, and it will be interesting to see how this Magic Gaming season plays out. This team will win a championship if… The roster turns out to be significantly better than what it’s anticipated to be. Forecasting the ceiling of Magic Gaming’s roster, it just doesn’t seem like a championship is in the cards. Should it compete for a championship at all this season, Reid and DT both have extremely high expectations to live up to. Although, it would not be shocking to see the Magic really give some of the better teams in the league issues in certain matchups. It is hard to imagine a team securing the first overall pick in the inaugural NBA 2K League draft, starting out 5-2 and still missing the playoffs. That’s the situation Mavs Gaming found itself in after turning in what can only be described as a disappointing season one campaign. The team lost its chemistry, it lost its identity and the 5-2 start gave way to a 1-6 finish. What followed was the most extreme rebuild the league has seen to date. Head Coach Jonah Edwards resigned from his position, the team shipped off Dayfri for a draft pick and even front office spots were vacated. Standing among the wreckage was Dimez, the cornerstone of the Mavs Gaming franchise, and a new cabinet of staff—including MPBA co-founder Toijuin Fairley as head coach. And maybe it was for the best. The Mavs made use of its plethora of draft picks—the only team in the league with five of them—and built out an impressive roster that checks all the boxes: talent, versatility and chemistry (as far as we know, anyway). It starts with the pick and roll duo of Dimez and fifth overall pick PeteBeBallin, the second center taken off the board in this year’s draft. If the Mavs were going to take a center with the fifth pick, it would undoubtedly have to come with the Dimez seal of approval, so Pete likely fits the bill as far as talent and chemistry is concerned. The backcourt pairing of Dimez and Mo will be vital, too. Mo and the Mavs are hoping his Pro-Am successes will translate to the league, and that his skillset can complement Dimez’s. Even then it’s not guaranteed that all will be well. BallLikeSeem was a good backcourt duo and teammate for the Mavs last year, yet still found himself as a casualty during the offseason purge. What could work out better for the Mavs this season is its newfound versatility. The results from last season’s switch to the shot-creating slasher 5-Out strategy were disastrous. It’s hard to make that big of a change mid-season when what was working before was working so well. That may be less of a concern with the additions of Rux and Grant Monster, two season one vets with proven production at multiple positions, and two of the savviest pickups in the later rounds of the draft. If the Mavs do need to switch things up, they’re better equipped to do it this year. So was the hit to Dimez’s reputation as a team player this offseason worth it? If the Mavs win, absolutely. But if there’s more trouble in Big D in season two and the team is forced into another rebuild by this time next year, there will be lots of questions that maybe not even the most famous NBA 2K League player of them all can answer. This team will win a championship if… The chemistry is as good as the Mavs insist it is. I don’t think anyone needs to be sold on the talent that this team possesses, but the season one Mavs were pretty talented too. The most important thing with the Mavs is making sure peace is kept in the locker room. The team has done a lot of talking on Twitter about off-court chemistry, but the honeymoon will soon be over, and relationships take a lot of work. Everyone is optimistic and has good chemistry in the offseason, but what about after two or three straight losses during the season? Which players are going to be held accountable and which aren’t? These are real concerns for this team. NetsGC came into the offseason with expectations to compete from day one. It wasted no time in proving that with its hirings and expansion draft selections. The Nets made a community-based hire in former Bucks Gaming analyst Ivan Curtiss (also known as OG King Curt). Ivan is known as one of the founders of MPBA, an amateur Pro-Am league that many of the league’s stars started in. The Nets then went into the expansion draft ready to make a statement, selecting NateKahl with the second overall pick and oShockey later on. These selections not only solidified the Nets core with two of the more talented role players in the league, but also established its culture with two of the most respected players in the league today. Building around Nate and Shockey, they embody everything you want in a winning culture. NetsGC looked to find players to bring even more of that to their organization in the 2019 entry draft. The Nets took Wavy with their first selection, a sleeper point guard many expected to fall more to the late-first, early-second area of the draft. Wavy brings upside; however, it will be interesting to see how he deals with the pressure of being selected early. After what some may have considered a reach with this selection, the Nets seemed to let the rest of the pieces fall to them, starting with Shuttles in the second round, whom many projected to go much earlier than the Nets’ second selection that day. Shuttles brings depth at the 4 and 5 positions and allows the Nets to have versatility in its plans to utilize Shockey. The two latter picks of Lavish and iiTzChas were also both selections of high-level players who were not expected to be there at the time of the Nets’ picks. The Nets came out of the draft with a result that was understood by many. Outside of its selection of Wavy, the team consists of players who know each other very well. NetsGC went for upside—which may come with risks—and selected players who could fill a void should one occur down the line. On paper, this looks like a roster that won’t cause many issues on the inside. The talent speaks for itself and this seems like a team primed to let it do that. It will be interesting to see how position battles play out throughout the season. Wavy and Lavish were both primary point guards on their respective Pro-Am teams, while Shockey and Shuttles are both centers who play the position at a very high level. iiTzChas was one of the more proven sharpshooters in the pool, but don’t be shocked if Lavish or Wavy tries their hand at the position, as this year bodes well for a sharpshooter with a point guard mentality. The pieces on the Nets’ roster go hand-in-hand. Should someone not produce to the level of expectations, it selected all of the proper pieces to fill that void should one occur. The Nets have a lot to be optimistic about. It has built a solid foundation. Should the team push each other to exceed expectations every day, look for this team to make a solid run into the postseason. Questions still remain, as they should for a new organization that hasn’t had the opportunity to prove anything yet. But look for the Nets to have solid answers for those questions starting April 2. This team will win a championship if… A star is born. The biggest question for this roster is going be if someone will step up and prove to be a superstar week in and week out. In this league, the best teams typically possess at least one player who is a complete game-changer on a nightly basis. We’ve seen NateKahl show his potential to be that last season, winning Finals MVP. However, it wasn’t shown throughout the year, as Knicks Gaming struggled frequently outside of the Ticket and the playoffs. If it can find superstar production while the rest of the roster maximizes their own roles, NetsGC could be really good. Offseason transactions: Acquired Ramo from Pistons GT in exchange for the 4th overall pick in the entry draft. There was significantly more optimism for the Pacers Gaming squad going into season one than what the final results entailed. Heading into last year, many believed Pacers Gaming drafted well and the names on the roster warranted that. But the Pacers hit road bumps along the way, starting with the delayed arrival of international point guard vGooner, who got no practice time on the league build before playing in the Tipoff. A gamble in the fourth round, the English star never quite worked out at point guard and found himself relegated to a pure sharpshooter when he was in the lineup. The sudden departure of The Playa, limiting the team’s lineup flexibility, likely didn’t do the Pacers any favors either. Though oShockey turned out to be a good addition to the side, integrating a new player into a team that ran a system as finely tuned as the Pacers was probably a challenge. Among all these issues, there were still some bright spots for the team. They were still one of the best defensive teams in the league, leading the league with 4.6 blocks per game and finishing sixth in the league with 6.2 steals per game. Shockey turned out to be a great fit for the organization, providing significantly more value than many other sixth-round picks. TuckerLocksUp was widely considered one of the better defensive centers in the league. However, the timing of everything never seemed to mesh, and other than a three-game winning streak midseason, the result of the Pacers’ 2018 season wasn’t something to smile about. Needless to say, it was an underachievement. Fast forward to the offseason. The Pacers wasted no time and quickly attempted to turn around its shortcomings to put themselves in a position to compete for season two. After retaining its consensus two best players, WoLF 74 and Swizurk, it sent shockwaves throughout the league by acquiring 2018 MVP candidate Ramo from Pistons GT for the 2019 fourth overall pick in the entry draft. With the team still needing to fill its point guard need, many speculated the Pacers would take a point guard with its second-round pick, yet they took a more unorthodox route and selected Lord Beezus. While it didn’t satisfy its immediate need, Lord Beezus can play the 3-5 at a high level, allowing flexibility throughout their lineup and even allowing Ramo to venture back to his natural position at power forward. The selection also indicated that it felt it had a sleeper point guard who would be available in the draft. Enter Matty. The Pacers selected Matty in the third round, a MyTeam player who qualified for the $250,000 MyTeam tournament in February—along with Beezus and Ramo. So with elite players at multiple positions and finally an answer at point guard, Pacers Gaming looks impressive on paper. It’s even more impressive when you look at how this year’s gameplay is set up. WoLF and Ramo guarding the pick and roll is going to be this team’s bread and butter. We saw previews of that in Pro-Am this year as WoLF and Ramo decided to team up on No Smoke to further their chemistry as teammates heading into this season. Add into the equation two of the better ball handling sharpshooters this year in Swizurk and Man_In_A_Car, with a high-level player like Beezus filling the gaps wherever he’s needed at positions 3-5, all you need with this team is for Matty to step up to the plate and take full advantage of the opportunity. Easier said than done, as we saw with this team last year. The Pacers seem stacked at every role needed to take that next step into being a contender. It is going to be interesting to see how this team comes together to ensure the shortcomings of last year remain just that. This team will win a championship if… The defense is as top-tier as it’s expected to be. This team could undoubtedly be the best defensive team in the league and 2K19 is the exact game where a defense-first team could ride that wave all the way to the promised land. While Matty still needs to prove he’s the guy at point guard, that doesn’t necessarily mean he needs to average 25 points per game. They just need a point guard who can take care of the ball and make the necessary plays when they’re needed. If they maximize what they’re really good at, and others step up as luxury, the sky’s the limit for this team. If you polled the general Pro-Am and NBA 2K League community on which teams had the best offseason, it’d be a safe bet that Pistons GT would find itself close to or at the bottom of most rankings. The trade of Ramo for the fourth overall pick in the entry draft sent shockwaves throughout the league and left the Pistons with a lot of questions about the direction it was headed. Trading an MVP candidate for a draft pick signals… something. GM Adam Rubin and co. didn’t trade their franchise cornerstone because they didn’t believe in Ramo’s talent. Something happened off the court. Is that an indictment of Ramo, or of the organization? We don’t know. The retention of JosephTheTruth at the cost of a second-round pick—a hard-working player and good teammate to be sure, but likely not worth the high pick in terms of talent—may tell us that a philosophy change and culture shift was needed in Detroit in the eyes of Rubin. It’s useless to speculate now, though, because Ramo is gone and never coming back. And hindsight is 20/20, so the decision to release Doza wasn’t some horrible mistake at the time, but watching their former point guard play his way into being a first-round selection has to leave a somewhat bitter taste in the Pistons’ mouths. But that doesn’t mean the cupboard is bare. Duane Burton, reigning coach of the year, is back, along with last year’s second-round pick iiNsaniTTy, a calming leader who won’t hurt any culture changes needed. Now the new additions have to come through. MrStylez recognizes the tall task of filling in the Ramo-sized shoes left behind, and said as much after the Pistons selected him fourth overall in this season’s draft. Filling those shoes will mean trying to jumpstart an offense that was downright awful last year. Pistons GT pulled off the impressive feat of qualifying for the playoffs as a third seed while having a negative point differential. When the team won, it was on the strength of its defense. When it lost, it was because its offense couldn’t keep up. It’s tough to tell what caused such an anemic offense, whether it was personnel or scheme to blame. But MrStylez’s best hope to rejuvenate it is through his pick and roll partner, l1lMayl1l. The point guard-center duo will likely be responsible for the bulk of the team’s scoring, mostly out of necessity. Iinsanitty will work fine as a tertiary scorer and could even take over as a secondary scorer, while Splashking and Joseph will have to show they can take on a heavier offensive load than last season. Jaacko, the lone New Zealand selected in the 2019 draft, could be a wildcard and will have to prove the Australia/New Zealand Pro-Am community can hang with North America. That’s not even mentioning that the loss of Ramo also means the loss of the team’s defensive anchor. The Pistons probably can’t rely on its defense to keep it in games anymore. Not that it probably matters much. The harsh truth is this is looking like a rebuild year for the Pistons. It’s not the worst thing in the world, because this offseason proved that rebuilds can happen in a snap if you play your cards right. Detroit doesn’t want to lose a bunch of games, but this could be the season where they establish that new culture, take inventory of the talent they have and prepare themselves for a big season three. This team will win a championship if… MrStylez elevates the offense to heights the Pistons have yet to see. On the court, this is his team now, and that comes with a lot of responsibility. Defense will be important, and he’ll likely be up to the task, but the offense cannot be lacking this season to point that it was last year for Detroit. It simply cannot afford to be. Coach Burton will need to build an offense that works around Stylez and ensures its best players can work offensively. If the Pistons can do that, they may just do better than everyone expects. Raptors Uprising GC was the antithesis of Mavs Gaming and Jazz Gaming last season. A team that didn’t have much preseason hype surrounding it which started the season with a record of 1-5 left viewers with little reason to pay much attention to Toronto. The team couldn’t figure out its best lineup and had a meat grinder of a schedule early, a good recipe for bad results. But once it figured everything out, the Raptors didn’t look back. A 7-1 run through the back-end of the season was good enough for the fourth seed in the playoffs, though the team met its end in the first round. How did Raptors Uprising do it? Finding its optimal offensive setup and taking full advantage of its draft gems. Kenny didn’t quite work out at point guard and was moved onto a shot-creating slasher while fourth-round pick All Hail Trey and sixth-round pick KingQuai614 proved integral to the team’s success. So integral in fact that the Raptors protected All Hail Trey from the expansion draft and brought back KingQuai in the entry draft, along with the return of season one teammate TsJosh, ensuring last year’s core remained in Toronto. It’s not the worst idea. All Hail Trey proved himself as one of the better stretch-fours in the league while you could argue the Raptors’ late-season run was sparked by the insertion of KingQuai into the lineup at center. The Raptors are hoping that same frontcourt configuration will work the same magic in season two. Joining the fray is Doza, an offseason star who saw his draft stock shoot up with his Pro-Am play, going from a fifth-round pick in 2018 to 15th overall in 2019. A decent come up, for sure. It gives the Raptors a true primary ballhandler, relieving Kenny—who probably works better as an off-ball player anyway—of those duties. It also gives the team a more steady backcourt scoring threat than it had last year. Raptors Uprising hopes to get similar results from second-round pick OOC Slim as it did from All Hail Trey and KingQuai. An under-the-radar selection, OOCSlim will likely slot in right beside Doza in the backcourt. Even as a second-round pick, however, the pressure won’t be on him to produce big results with Kenny, Doza and All Hail Trey likely to be bigger pieces on offense. That makes for a smoother transition for a player that finds himself on a team full of players already familiar with each other. And that familiarity will be a lot of what the Raptors will bank on in season two. The team undoubtedly upgraded its talent in the draft, but you don’t bring back two season-one players in that same draft for nothing. The core proved it could be a playoff team last year, but is continued chemistry and a talent upgrade enough to keep up with all the other teams that massively improved their rosters? That’s the big question. This team will win a championship if… It harnesses whatever caused that 7-1 run and learns how to sustain that against elite teams. That kind of stretch is something only the best teams in the league can pull off. Now the Raptors have to hope they can do something like that against the best teams in the league. Remember, it took a lot of losses to a lot of good teams early in season one and couldn’t get past the quarterfinals of the playoffs. To take the next step, it’s time to beat the best of the best. It’s the only way to win a title. The T-Wolves introduced themselves to the NBA 2K League with a bang, acquiring scoring maestro Hood in exchange for the third overall pick (oLARRY) in the expansion draft. Its second move, grabbing FEAST, was arguably more prescient. Add to that the early makings of a spectacular facility, a strong content game and a powerhouse front office, and the T-Wolves have the makings of one of the faces of the league. You need to win to be a face, though, and the T-Wolves haven’t won anything yet. Yes, it was the beneficiary of BearDaBeast’s fall in the draft, snagging him at No. 11, and yes, FEAST could easily have been a first-round selection in the expansion draft. Coach Shawn Vilvens perfectly fits the Jeff Terrell mold that served 76ers GC so well last season, and the team has strong connections with 2K Analytics through Business Manager Max Minsker. Putting all that into play and meeting all that potential is no easy task. How well do the T-Wolves figure to fit the meta? Bear should be locked in at point guard. With TURNUPDEFENSE likely to start at shooting guard, it may throw some interesting wrinkles at teams. It’s not inconceivable, though, that it succumbs to what figures to be the standard lineup (offensive guards, lock at the three) and put Hood and Bear together in the backcourt, with TURNUPDEFENSE moving to lock. One area the T-Wolves project very capably is in the frontcourt, with FEAST and JoJo both capable stretches. Frontcourt scoring may well be the subtle difference-maker this year, and everyone in the T-Wolves frontcourt can put the ball in the basket. But chemistry, not talent or fit, is the most important thing for this team. Hood and TURNUPDEFENSE were teammates last year in Cleveland, and the Cavs weren’t exactly the most cohesive team. The T-Wolves most likely confirmed that the two are friends ahead of the pick. Hood and BearDaBeast are similarly expressive personalities and players. While there are few better glue guys in the league than FEAST and Nacho, who takes the last shot—and if that last shot doesn’t fall, who says what? If it comes together, the T-Wolves will be the dangerous team its talent suggests it to be, capable of winning multiple tournaments and potentially a championship. If not… well, it could be a long first year in Minnesota only to go home early. This team will win a championship if… BearDaBeast and Hood form the formidable duo they have the potential to be. The two need to coexist on and off the court. If they manage to do it well, then the T-Wolves will have two star players and scorers aided by an above-average complementary core. Two true stars are hard to come by, and these two gives T-Wolves Gaming an immediate advantage. Night and day. The only way to describe how Warriors Gaming Squad was viewed coming into season one compared to season two. Entering season one, many were left scratching their head with how the Warriors decided to go about selecting its squad. Being the only team to select a pure sharpshooter in the first round, the confusion was understood. Take a look back at a few of the selections that followed—see MVP candidates and retained players alike—the confusion is solidified. The Warriors, however, were able to find a few bright spots in their 2018 season. Type, protected for the 2019 season, was widely considered one of the best defensive bigs in season one, while BSmoove, also protected, is a player who could thrive given the right circumstances—most likely as a secondary ball handler. Enter the 2019 offseason and the Warriors proved to be aware of that, wasting no time in looking ahead to the 2019 entry draft, starting with the trade of Vert to Lakers Gaming for the 10th overall pick in the draft. The move locked the Warriors into two of the first 10 overall picks in the draft, about as good as it gets when it comes to hitting the reset button. With the second overall selection, Warriors Gaming Squad chose Gradient, a player that many considered to be the best overall defender in the 2019 draft pool. Rightfully so, this pick alone is something to be excited about as this will likely skyrocket the Warriors up defensive leaderboards, now having two of the most highly-touted defensive players to participate in season two. No more than 30 minutes later, the Warriors followed up the pick with the subsequent selection of point guard CB13 (formerly known as Kina). Type, BSmoove, Gradient, CB13. The Warriors now have the core to make you think “contender.” Add in Jin, a solid contributor to a playoff Wizards District Gaming team in season one, and Chiquita, the first-ever woman drafted to the NBA 2K League, who hopes to make more of an impact on the team than just by being in the record books, and instantly the Warriors are a scary sight for season two. Night and day. With one of the better drafts under its belt, the Warriors go from a team attempting to prove itself to now being a team with a target on its back. It’ll be one of the more exciting storylines to see if Warriors Gaming Squad lives up to expectations. Will they live up to the hype like their NBA counterparts? Or will this be one of those times the names on the paper turn out to be just that? Needless to say, Warriors Gaming Squad has quite the season to get ready for. This team will win a championship if… A superstar emerges. Gradient and CB13 were drafted to be that. Gradient has the potential to be a game-changing player. He has the skillset to take over a game from the defensive end. On the other side, the same can be said for CB13. He was brought in to produce offensively in ways they couldn’t last year. If they both maximize their own roles, it’ll allow the others to step up immensely. Anything short of that and a championship will likely be out of reach. Although Wizards District Gaming’s 2018 season ended on a playoff loss, many would consider the team to have plenty to be optimistic about. MVP candidate Boo Painter had established himself as one of the best players in the world. Protecting and pairing him with 2018 first-round selection DemonJT, the team kept one of the more talented duos in the league. After pulling the trigger on acquiring Dayfri in exchange for a first-round draft pick, many considered Wizards DG one of the frontrunners to hoist the NBA 2K League trophy at the end of season two. With this move, the Wizards not only had an MVP candidate and talented point guard, it also added one of the most prolific big men in the league. The Wizards had everything to look forward to with key positions solidified and one of the best frontcourts in the league. All it needed was to find the two missing pieces to complete the roster on draft day. Well…until the NBA 2K League dismissed and disqualified Boo Painter from NBA 2K League competition for an undisclosed violation of the league code of conduct. With only a third-round supplemental pick to show for the loss of its best player, the question arose as to how the Wizards would proceed with the curveball thrown at them. It became apparent on draft night. With one of the later picks in the second round, Wizards DG selected UserPick. With his ability to produce at a high level in at least more than one position, he was a great selection given the Wizards’ circumstances. UserPick could be viewed as an extremely elite talent once he’s able to prove himself on the floor. He is also a player who could run point guard should the Wizards decide to use Demon JT in a secondary ball handler role. Wizards DG then followed up the pick by selecting PaulB with the first of their two third-round picks. PaulB is considered one of the better stretches from PS4 but his value doesn’t stop there. PaulB epitomizes the term “glue guy.” He is presumably the prototype fit next to the high-energy players in Dayfri and Demon JT. Not everything PaulB does for this team will show up in the box score but he will undoubtedly provide value nonetheless. It would be tough to consider Wizards DG title contenders this year compared to how they look just six months ago. However, given the circumstance, this team still seems poised to win games and be a tough out. Dayfri is still one of the best centers in the league. He also seems to gel really well with Demon JT, as the two got a headstart on their chemistry by combining forces in Pro-Am. It looks as if the team surrounded the duo with proper pieces for success. The organization seems to truly care about success and the risks it took this offseason only further prove that. We need not question whether or not this Wizards team will give 110 percent every time they take the stage stage; their trash talk alone makes them must-see TV. But trash talk won’t count in the win column in what figures to be an ultra-competitive league, and the Wizards will have to back up that trash talk without the services of a former MVP candidate. This team will win a championship if… Demon JT and Dayfri prove to be an incredible duo. There’s no denying that Wizards DG has quality assets. Just like last season, however, the team’s fortunes will hinge on the output of its star players. On paper, the Wizards may not look like title favorites, but as last season showed, chemistry and a lethal pick and roll duo gets you pretty far in this league. Dayfri and Demon JT may be more motivated than ever, and if they harness that motivation and take it to the court, the Wizards will be a formidable opponent night in and night out. Will – oFAB, Celtics Crossover Gaming: As you’ll see with my next prediction, I’m big on the guards this year, and there are few point guards on the same level as Fab. The Celtics missed the playoffs last season in one of the more disappointing ends to a season for any NBA 2K League team, but it’s hard to count out a team with this much talent for a second year. Also, consider the following: Fab fell victim to not being able to change his jumpshot for weeks (months? ), which matters! And don’t forget he averaged 17.1 assists per game. SEVENTEEN assists every game! That’s 3.5 assists per game more than Radiant, second in the league in that stat. The Celtics’ draft also looked to build around its franchise cornerstone, adding a shooting guard in Bully with the eighth overall pick and the center they wanted in NO xAUTOGRAPHSx in the second round. Look for a rejuvenated Fab—in both body and mind—to take over in season two. He was the second overall pick ever for a reason, you know. Josiah – Radiant, 76ers GC: This is the point guard’s year. More precisely, this is the scoring point guard’s year, and there are few point guards who can score like Radiant. The 76ers have preserved the core elements of its pace-setting offense, and with an extra year in the system and a league build perfectly suited to his game Radiant is poised to capitalize on the likely spike in offense like no other guard. Winning MVP takes more than individual talent, but on top of what will almost certainly be an impressive statistical campaign, being the best player on one of the best teams in the league certainly won’t hurt his case against players like MamaImDatMan (Blazer5 Gaming) and Dimez (Mavs Gaming). Len – Radiant, 76ers GC: Radiant was arguably the best point guard in season one. He stuck it out with his favorite archetype, the sharpshooting playmaker, and never waivered—pre- and post-patch. However, last year’s gameplay didn’t cater to that play style. It wasn’t going to put up the same numbers as other positions, like say, the shot-creating slasher. But this year seems to be a different ball game. A point guard looks to be the life and soul of a team in contention. The exact game a player like Radiant has will prevail and further solidify himself as the best in the world. Will – BP, Kings Guard Gaming: Yes, BP. Despite DIMER’s recent report that the third overall pick in this year’s draft was looking for a way out of Sacramento, I’m going to make the risky pick and still say BP will be the most impressive rookie of season two. A trade request doesn’t mean a trade will happen, and internal relationships can always be repaired. If BP does stay with the Kings and regains the trust of his teammates to keep his starting point guard position, I think there’s a perfect storm brewing which will make the award his for the taking: he’ll be the number one scoring option, he’s on a team that could make the playoffs (and if they do, it’ll probably be because of his play and the award should definitely be his) and he has a good center and shooting guard surrounding him, two things every good point guard needs. I could very well be eating it with this pick, but fortune favors the bold, I say. Josiah – Vandi, Grizz Gaming: The Grizz, I think, are going to surprise a lot of teams this year. That will be in large part due to Vandi’s scoring at point guard, which will propel the Grizz to the playoffs (and if it doesn’t, look elsewhere). Vandi has one of the best big men in the league in AuthenticAfrican to work with, and that will help ease the rookie into the league while getting him in at a high level initially. Guards are all the rage heading into the 2019 season, and being a scoring guard on a new playoff team is an excellent resume to present to the committee. It’s just enough, this season, to take home the award over competitors BP (Kings Guard Gaming) and JMoneyRep817 (Heat Check Gaming). Len – BreadwinnerLA, 76ers GC: Rookie or not, BreadwinnerLA comes into season two as one of the most high-level players 3-5. It’ll be interesting to see exactly how the Sixers choose to utilize BreadwinnerLA’s versatile skillset. But regardless where they decide to deploy Bread throughout the year, rest assured he will impact the game at an elite level. Look for BreadwinnerLA to come out with a vengeance after slipping in the draft to one of the better teams in the league. Will – WoLF 74, Pacers Gaming: I’m going with a simple formula for this award. The most consistent offensive threat throughout the regular season last year was centers (the dominance of the shot-creating slasher wasn’t prevalent until midway through the season). So who wins Defensive Player of the Year in season one? A center. The most consistent offensive threat in the finals was a shot-creating slasher. So who wins Finals MVP? The guy who defended a shot-creating slasher. Following this trend, I can say with confidence that lockdown defenders will be part of the season two meta, and they’ll be tasked with handling the biggest offensive threats this year: point guards. Some speculate a center could still win this award, but I say it’s very much in the hands of the locks. There are few locks on the level of WoLF, and he’s revered for his defense for a reason. This award is his to lose. Josiah – WoLF 74, Pacers Gaming: WoLF has been arguably the best defender on NBA 2K for several years now, and with the game build enabling steal after to steal it’s hard to picture any lock topping WoLF’s output. He sparked an in-season run at point guard last season, but returning to lock and the natural explosiveness that accompanies that return has Wolf the clear favorite to take home the DPOY award over such challengers as Breadwinner (76ers GC) and TURNUPDEFENSE (T-Wolves Gaming). Len – WoLF 74, Pacers Gaming: Last year, the style of play was solely a battle of who could control the paint. This was the case for both offense and defense. So while WoLF was considered one of the better perimeter defenders in the league, the lockdown position, at which WoLF specializes, wasn’t going to be involved enough to make a reasonable impact compared to centers that were constantly defending the paint. All signs point to that changing this year. Look for WoLF to terrorize point guards week in and week out, putting up the counting stats while doing so. Will – Jeff Terrell, 76ers GC: Assuming the 76ers have the season I expect them to (spoiler for our next few sections), Jeff Terrell should be well within the Coach of the Year discussions and has a good shot at winning the whole thing. The coaching talent pool runs fairly deep in the NBA 2K League, but Terrell’s unique system he has instilled in the 76ers along with the insane talent at his fingertips sets him up as the frontrunner to take this award home. Josiah – Jeff Terrell, 76ers GC: 76ers GC knew exactly what it was getting when it signed Jeff “TheWhiteKite23” Terrell to a long-term extension after the 2018 season. The former college point guard developed the 76ers’ lethal offensive attack last year. Expect him to replicate the team’s offensive success once again this year, but turning Radiant into an MVP candidate, as well as his player development of Breadwinner, Newdini and oCASSIUS, will have Terrell taking the COTY award home to Philadelphia over Ricco Phinisee (Celtics Crossover Gaming) and Cody Parrent (Pacers Gaming). Len – Ricco Phinisee, Celtics Crossover Gaming: Throughout the offseason, the Celtics continued to see the relationship between Ricco and the organization’s players grow. There is no question that the Celtics came up short in season one, but with a whole offseason to analyze what went wrong, expect Ricco and the Celtics to turn around their shortcomings in season two. Note: These are quite difficult with the influx of new talent from the season two draft, and these power rankings mean a lot less than the one we will release after the Tipoff. Feel free to get mad at them anyway. This is a composite ranking of all three of our writers’ power rankings. Tiebreakers determined by highest individual writers’ ranking between both teams. Will – 76ers GC vs. Blazer5 Gaming: Yep, a season one Tipoff finals rematch. For the 76ers, I’m confident they’ll be, at the least, one of the best teams all season, and as you can see above with the playoff predictions I’m not alone. The team somehow lost FEAST and came out of the offseason as strong as ever. I’m also confident that there will be no Mutombo-like backboards to shut down Blazer5 Gaming, and no fluky best-of-one playoff shenanigans. If this holds up, the viewers are in for an absolute treat. Josiah – 76ers GC vs. Celtics Crossover Gaming: Man, those playoffs are stacked. I wouldn’t raise an eyebrow if any of 15 different teams made the playoffs. But I’ll go with some of the presumptive perennial heavy hitters as well as a smattering of surprises. Those tend to flit away, however, and unless a team gets as hot as Knicks Gaming did last season, I think more seasoned teams make it to the Finals in the new playoff format. In a point guard-driven year, they’ll need star point guards, and Fab and Radiant are two of the best. Throw in two of the best coaches in Ricco Phinisee and Jeff Terrell, and we’ve got ourselves a Finals matchup for the ages. Len – Pacers Gaming vs. Celtics Crossover Gaming: The Pacers line up perfectly for the gameplay this year. Maximizing positions 2-5 with the best possible talent will prove vital for them all year. Look for WoLF 74, Lord Beezus and Swizurk to all have career years. Add to that the production of a 2018 MVP candidate in Ramo, and this organization has everything you want in a championship roster. On the other hand, the Celtics will be the first to admit they underachieved in season one. Look for it to learn from those mistakes and capitalize on bringing in the proper pieces to surround its core group in oFAB and Mel East. The team will continue to build chemistry with Profusion, Bully is flying under the radar as one of the premier sharpshooters and NO xAUTOGRAPHSx looks to be a significantly more compatible option for this team moving forward than the likes of Arsonal x. The Celtics looked primed to take the next step into contending for a championship. Will – 76ers GC: This was an elite team in season one and it may have gotten better somehow. I think Radiant will come back with a vengeance after being knocked out in last year’s semifinals, where he had plenty of assists but not nearly enough scoring for it to matter. That should be different this time around. While I have oFAB slotted in as MVP for the season, I think Radiant has a better supporting cast in Philly than his counterpart does in Boston. Winning a championship is still a team accomplishment, after all. If that’s true, I’m confident the 76ers have the best team in the league, plus it has shown it can in fact perform in elimination situations with its Tipoff success last year. This might be the easy pick, but I don’t want to overthink this too hard. 76ers GC are going all the way. Josiah – Celtics Crossover Gaming: I picked 76ers GC to win it all last year when playoff time came around. I won’t do that to them again, because I have the sneaking suspicion that it can’t be so easy for one of the league’s most talented teams. I don’t think Radiant will disappear in the playoffs as he did against Heat Check Gaming last year. But I do think that oFAB wants to show the entire world this year that he’s the best point guard in the world. He has to be hungrier than ever for that. The Celtics will have gotten to this point with Mel East throwing opponents off their game and with Bully becoming one of the best sharpshooters in the league. Compared to their talent, the Celtics came up short too many times last year. They won’t do it again when it matters. Len – Celtics Crossover Gaming: It’s hard to pick a team to win it all when it has questions at point guard this year. Should Matty produce at a high level, this pick easily becomes Pacers Gaming. However, with oFAB at the helm and a bunch of talent he’s is familiar with, expect this team to completely turn around its shortcomings from 2018 and become a champion in season two. The Celtics were so close to a lot of accomplishments last year. Look for them to capitalize on those opportunities this year.